Typical joint locations are covered in the article on Joints, and are not repeated here. However, it is important to note that joint locations should be indicated on the construction plans and planned in advance (Figure 1). Intersection joint locations can be quite complex and should be marked out on the base in advance (Figure 2). Shrinkage cracking. Since contraction joints are used to control shrinkage cracking, they should be sawed before slab shrinkage stresses become great enough to cause uncontrolled cracking. See Figure 3. PCC support strength and joint raveling. Sawing must be delayed until the PCC is strong enough to both support the sawing equipment and to prevent raveling during the sawing operations. See Figure 4. Thus, as the PCC hydrates and strengthens, there is a short window of time in which sawing can occur as illustrated by Figure 5. Transverse contraction joints are usually cut to a depth of 1/4 – 1/3 of the total slab depth to ensure cracking occurs at the joint (Figure 6). For example, a 250 mm (10 in.) thick slab would require a joint depth between 63 and 83 mm (2.5 and 3.3 inches). In no case should the sawcut be less than 1/4 of the slab depth. 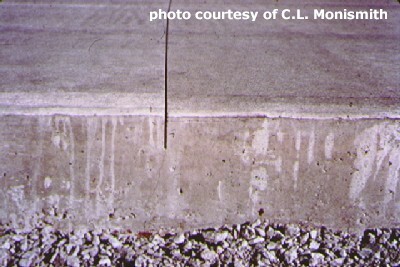 The FHWA (1990a) recommends that transverse joints be cut in succession rather than skip sawed (e.g., initially cutting only one out of every 5 or 6 joints then going back later and cutting the rest) because skip sawing can result in a wide range of crack widths that form beneath the sawed joints. 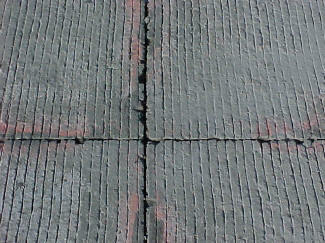 These varied crack widths may cause excessive sealant stresses in the initially sawed joints initially. Figure 6. Contraction joint showing sawcut depth. Expansion, isolation and construction joints are created by formwork before the PCC is placed. Since these joints are designed to completely separate adjacent masses of PCC, they are usually made by inserting a small non-PCC piece of material such as a strip of wood. Ensure adequate PCC is available to finish the last slab of the day. The construction joint is set before all the PCC is placed. If truck delivery is stopped to soon, the temptation may be to use the lower-quality PCC that has been pushed in front of the screed to fill the remaining volume. This low-quality PCC may contain little portland cement, excess water, low air and/or segregated aggregate. Ensure proper consolidation. 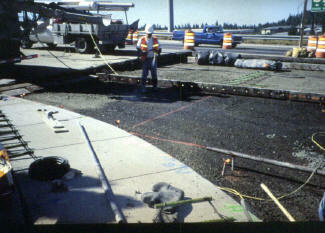 Typically, the paver does not traverse the construction joint. Therefore, the construction joint is not consolidated by the paver vibrators and it should be manually consolidated. Dowel placement should not segregate or cause air voids in the adjacent PCC. Sometimes, dowel bars are placed after the PCC has been placed up to the header. If dowel bars are pounded in by hammer, the resultant vibrations may cause air pockets or segregated aggregate. Hot-pour liquid sealants. These sealants are heated up to decrease their viscosity and then poured. Joints are ready for traffic as soon as the sealant has cooled. 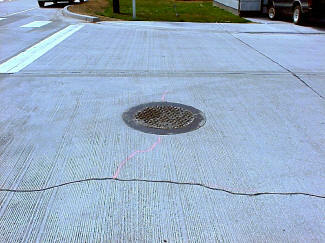 About 25 percent of roadway agencies use hot-pour sealants in transverse contraction joints. Most hot-pour sealants are used in longitudinal joints and low-traffic PCC pavements. Figure 7 shows joints filled with hot-pour sealant. Compression seals. These are preformed rubber compounds placed into a joint under compression. After they are placed, they form a seal by pushing against each side of the joint and are immediately ready for traffic. Compression seals, commonly called neoprene seals after their primary constituent, are used by about 21 percent of roadway agencies in transverse contraction joints. Silicone sealants. These sealants are silicone polymer compounds that are poured into joints at ambient temperatures. 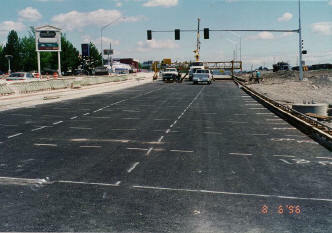 It generally takes about 30 minutes for them to harden and make the joint ready for traffic. About 52 percent of roadway agencies use silicone sealants in transverse contraction joints. Figure 7. 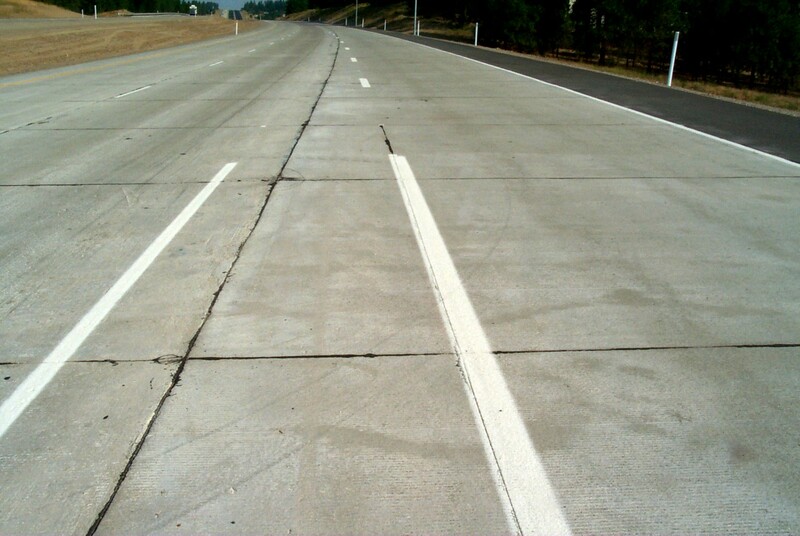 Joints sealed with hot-pour liquid sealant on a freeway on-ramp (normally, joints should coincide with lane divisions as they do near the horizon of this photograph).